As some of you already saw on Flickr, I got two big boxes this last Friday, containing the goods I won on an eBay-auction. 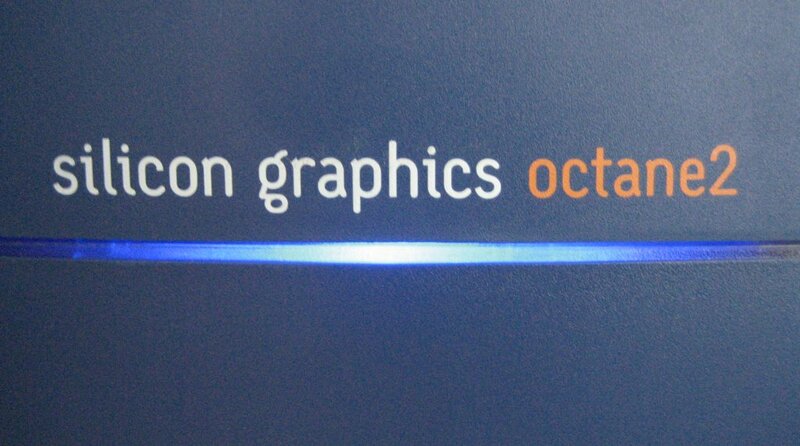 I bought a wonderful Silicon Graphics Octane2. Somehow I can’t get enough of these wonder boxes from (not so) long ago. 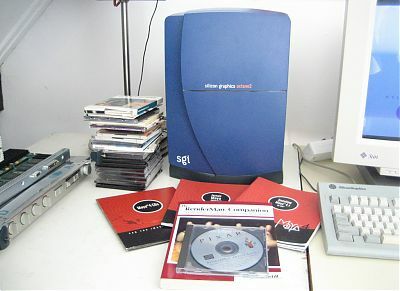 This site started out on a SGI Challenge S, which I also bought from an auction, some five years ago (and which I could colocate inside a suitcase). In between I gathered several Indy’s, one of which is now my MP3 player. 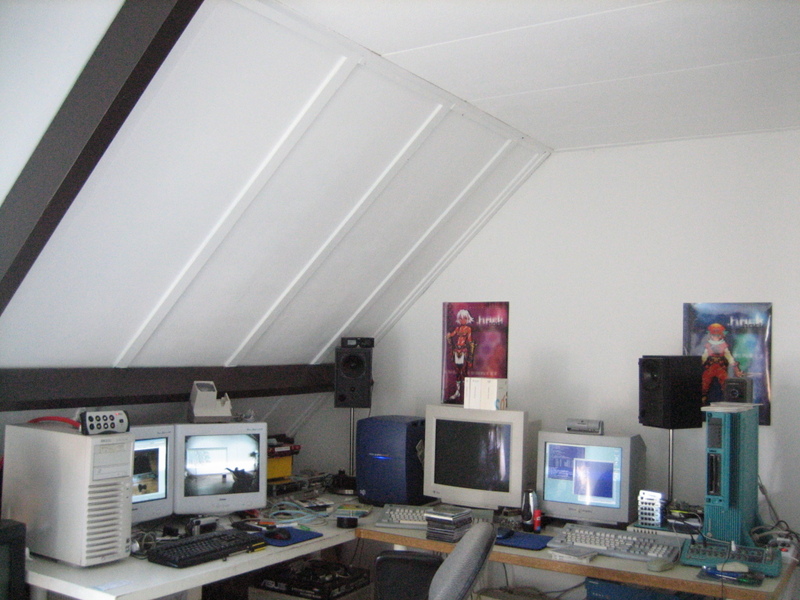 I even picked up an Origin 200 by train one day, but that one never worked and last year I bought an Indigo2, with analog video in/out, which I use in my little studio built on obsolete gear. That’s 6 years ago… The one I bought is actually quite a light model. The chassis, XBow, PSU and motherboard are all Octane2, so I can upgrade to top options (R14K, 8GB, V12 graphics) if I want to. The CPU’s in mine are 2x R10K 250MHz 2MB cache and I’ve got 1GB of memory (8× 128MB) in there. I got SSE graphics with it and V6 graphics, but I also already bought V8 graphics too so I’ll have the maximum of texture memory in there. 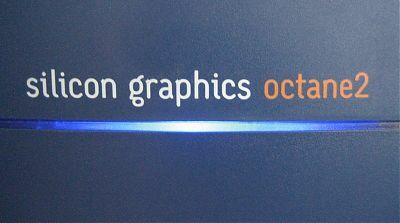 (V8 and V12 graphics can have up to 108MB used for textures as opposed to 8MB or less for all other options). 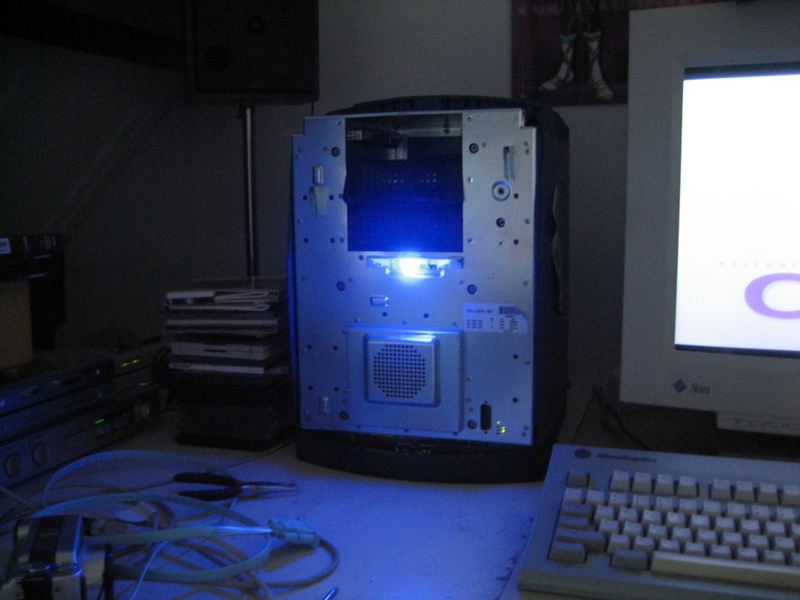 But, next to the fact that this specific model seemed like an ideal one to upgrade through time, one other reason was the software that came with it (and is officially licensed to this very machine). It came with Unlimited Maya 4 and Pixar Renderman. Now of course, these are old versions, but for this little studio of mine, it’s either open source or legally licensed proprietary software. And since I do this on a very tight budget, in case of the proprietary software, that automatically indicates I’m using old versions and I really can’t be bothered with that. I mean, imho it’s something of a marketing ploy to let you think you can only do some really creative work on the latest version of some super duper software on brand new machines. For me, the challenge is to see if I still can get something out of this old machinery and old software which was top of the hill not so very long ago. And it really doesn’t matter what I get out of it, for me personally, everything will do. I mean, the price I paid for all this gear is one so I can freely try some stuff and if it doesn’t work out? Well, too bad. (the price of the software included I paid less than 1% of the original list price… think about that for one second). Renting the newest gear for a day is more expensive than what I paid for this, so who cares if it’s slow? I’ve got all the time in the world with these machines. As you can imagine, this weekend I’ve been busy getting to grips with this Octane and while I was busy, I thought I’d revive the lightbar too. 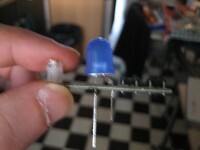 It’s quite common for these machines that the lightbar stops working after a while and mine was no different. 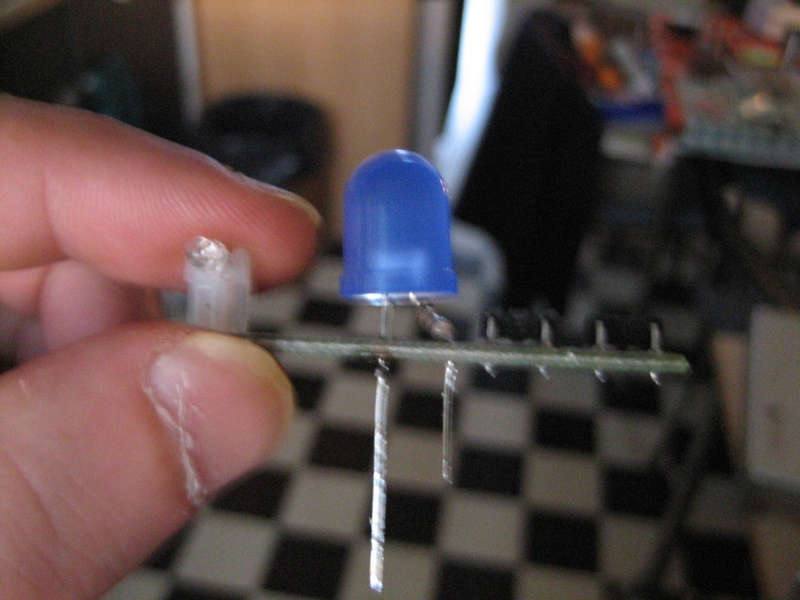 So in between installing and playing around, I put a blue LED in there. It’s not that difficult and here you can read how you do such a thing. 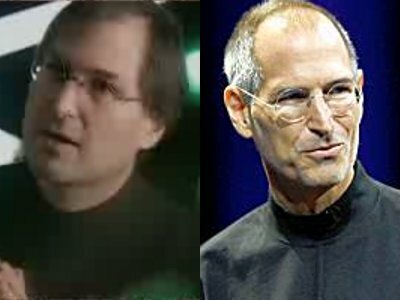 And then something else but probably a side effect of using Silicon Graphics gear, I guess it keeps you young. left, Steve when he worked an Octane. Right, when he tried to do everything on an iPhone. Well, even with the price drop of the new iPhone, you can still shop for an Octane for the price of said phone… no joke. to the left, my custom black iPhone since October last year. 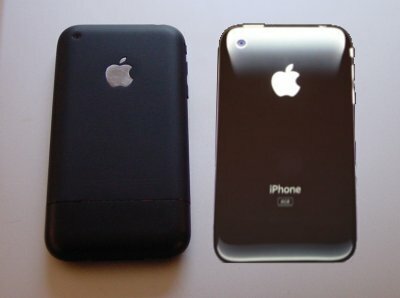 To the right, the all new black iPhone available from July the 11th. Congrats on the Octane2! 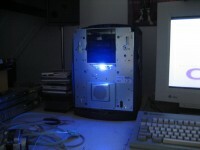 It is a wonderful machine and I use one every day at home as my primary computer, although I’m at work right now. When I saw you were using an optical audio conversion on your Indy, I wondered if you were going to buy an Octane since it has it built in. yeah i was thinking of you and your dual P3 and your 3D-experiments when I bought this one. Neat! I keep popping by and never disappointed. From one Mark to another – keep up the good work! 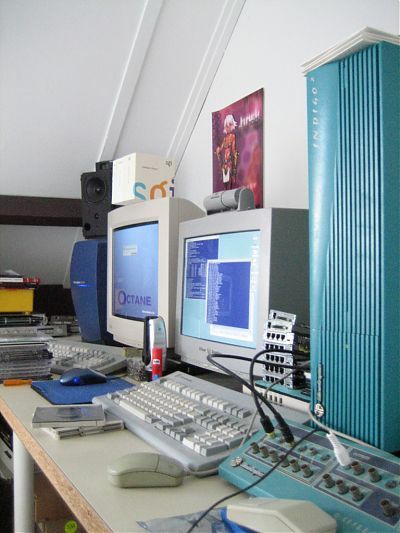 Congratulations on your Octane2 – I’m about to get one myself, although it has the later green skins (the ones with the new sgi logo). I hope to have some serious fun with it. Although it’s not legit, I plan to load Maya 6.5 on it soon, and if I can find it, Matlab R13. Matlab isn’t exactly fun, but Matlab on an SGI should be.